This adaptation was based on Christie's short story 'The Veiled Lady', first published in 1923. The screenplay was written by Clive Exton, and the director was Edward Bennett. The adaptation stays largely faithful to its source material, since most of the added scenes are extracted from tiny references in the short story. There is, for instance, the opening scene displaying the Bond Street (here: Burlington Arcade) robbery and the funny scene with Poirot dressed up as a locksmith. Some sequences have changed location, such as the first meeting between 'Lady Millicent', Poirot and Hastings (now in a lavish hotel), the denouement (now in the Natural History Museum). Some elements are added, including the presence of Miss Lemon (who doesn't get much to do) and Japp (who gets to bail Poirot out of prison (!) and chase the culprits (yes, there's an added chase scene as usual, but this one makes excellent use of the location!). My main criticism of the script is that a large section of Poirot's explanation is cut. How did he know that Lady Millicent was not Lady Millicent? How did the culprits know about the hidden Chinese box and the letter? All of this is lost in the adaptation and could actually leave viewers confused as to what had actually occurred. Edward Bennett does a competent job of showcasing the locations. This episode is yet another example of the extravagance of the production team. In scenes that could easily have been depicted in low-key sets, they go for large hotel lobbies (a.k.a. Senate House, London) and famous places like the Burlington Arcade and the Natural History Museum (see Joan Street's website for photos). The soundtrack for this one is magnificent (again, by Fiachra Trench), and I really wish it had been released on CD. Poirot's wonderful disguise is quite out-of-character in a way, but at the same time, he is known to resort to made-up identities, and the whole locksmith business does sort of take place in the short story (he doesn't seem to be disguised there, but such an addition makes complete sense). I agree that if there's one thing that should NEVER be cut from an adaptation, it's Poirot's explanation. Interestingly, in the short story, Poirot's first response to Lady Millicent's dilemma is, "Would it not be wiser to confess all to your future husband?" That line is not in the adaptation. Now, I realize the writers and producers probably saw it as irrelevant and its removal was a time thing. But to me, it speaks to Poirot's character. 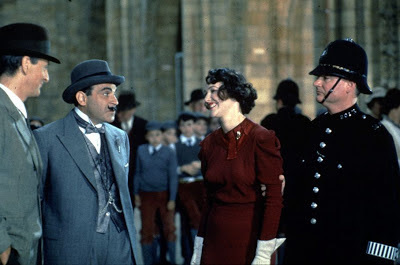 Suchet claims Poirot dislikes the upper class, and I think the series tries to show Poirot working against the conventions that lead to such secrecy, urging people to confess to each other. In Incredible Theft, for example, he prods Mayfield to show his wife what he's being subjected to blackmail about. I think the person Suchet is trying to convey would/should have told Lady Millicent, "if you can't confess your flaws to this man without his blowing up at you, you shouldn't marry him." Christie took elements from the Holmes story for this one without thinking very hard about whether they would fit Poirot. Whoops, I meant to say, "this is a pretty blatant send-up of the Sherlock Holmes' story 'Charles Augustus Milverton' up to and including the BREAK-IN"
Sure, there was much to enjoy here (Japp's expression of smug triumph before helping Poirot out of jail, and the superb performance of Terence Harvey spring to mind), but my goodness what an AWFUL, overbearing score, and how tedious to be subjected to yet another stupid chase scene. The latter has become a cliche within the series, and that's sad and embarrassing. In my opinion Series 2 was mostly a flop, and this episode was a contributing factor. On the contrary for me, this is one of my favorite episodes, and I love the second season in general. Also the piece of score during Poirot's bike ride, is my favorite variation on the theme from the entire series. Yes it's so uplifting and comical. I have so enjoyed reading your commentary on this blog (which I now faithfully do after watching each episode). Thank you! I agree that the bicycle scene is out of character. In the story Poirot masquerades as a security specialist but there is no suggestion that he would dress as a blue collar worker. The chase scene in the museum is also ridiculous but it helps to fill out an otherwise thin story. And yes, it is too bad that they left out Poirot's explanation when he was asked what tipped him off to the false "Lady" -- that her shoes were not good enough for a real "Lady Millicent." Hello, we adore the series as well. Could you answer our questions about this episode? 1. How did the letter play into the theft of the jewels? We’re they going to blackmail the real Lady Millicent? 2. Did the ‘gang’ have Lavington killed or was that a fluke? I too would enjoy an explanation of the letter. We know what the gang was after the box and killed their compatriot for hiding the jewels. Presumably it was the compatriot who hid the jewels and that is why they committed the charade of retaining Poirot, in order to discover its whereabouts. (It was silly for the gang to kill their deceitful colleague before ascertaining the location of the box, by the way.) If he hid the jewels, he must also have hid the letter. I can only assume that the letter was a real one to be used for some other occasion. I think it would have been far safer for the gang to ransack the home themselves rather than risk Poirot finding the jewels.